Proud Of Our Role In Building Happy, Healthy, Strong, Confident Kids! For children who are walking to 18 months old, our FUN Toddler class is designed to provide safe exploration, positive social interactions, parent-child bonding activities and gross motor play. For the more energetic 18 month – 30 month old, our Parent ‘n Peanut class is sure to foster healthy movement, build confidence in movement awareness and introduce key concepts such as taking turns, sharing, listening and following directions. Up to 6 years old. 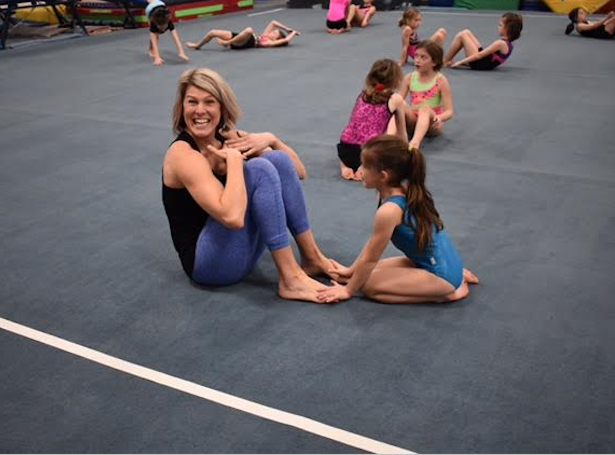 Our preschool program has been designed to provide fun, safe, developmentally sound progressions so each child begins to understand their body’s capabilities and limitations through the wonderful sport of gymnastics. 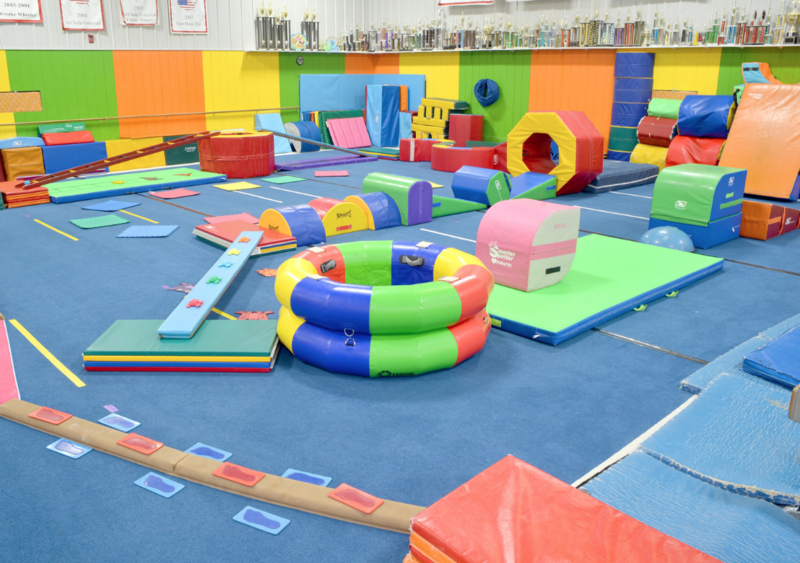 Get ready to tumble through the gym! 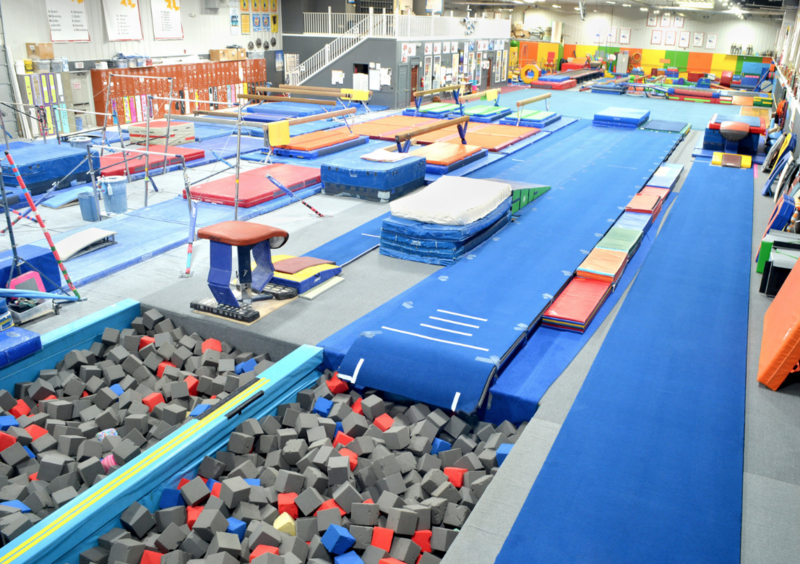 All tumblers will learn skills on the floor exercise, trampolines and tumble track. 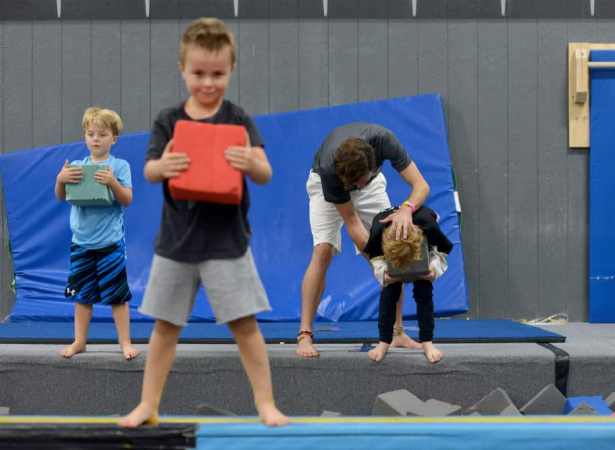 Students will be working towards their tumbling goals by breaking skills down into drills that promote safe learning and proper gymnastics progression. There is only one way to teach tumbling…the SAFE way!! 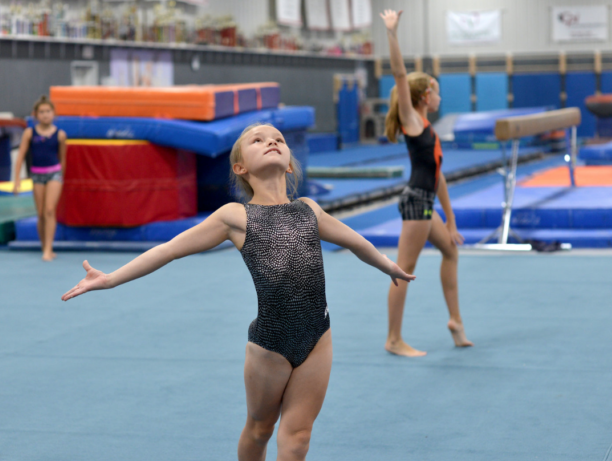 Our in ground trampolines and pits, our 40’ long tumble trac along with our double mini trampoline and spring floors are put to use in Trampoline 1 & 2. 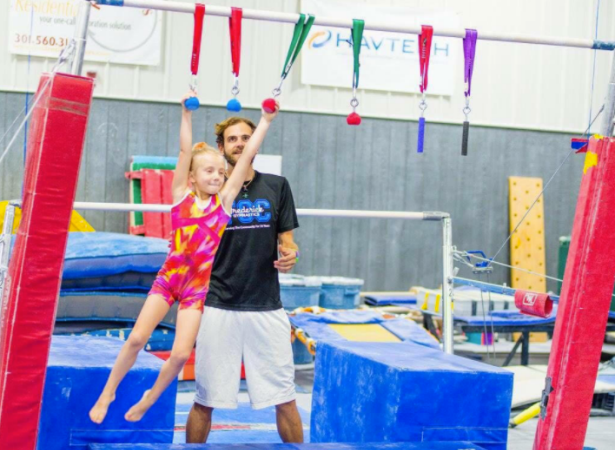 From jumps and turns in Trampoline 1 to flips and twists in Trampoline 2, students will learn in a safe and progressive manner utilizing over-head spotting belts, when needed, to give that extra boost of confidence when learning new, more difficult tricks. Get Fit program is here to provide an avenue for teens and adults to get a great workout. Individually based functional fitness with gymnastics style conditioning and body weight exercise. Specific focus is given to balance, joint stabilization and core strength. 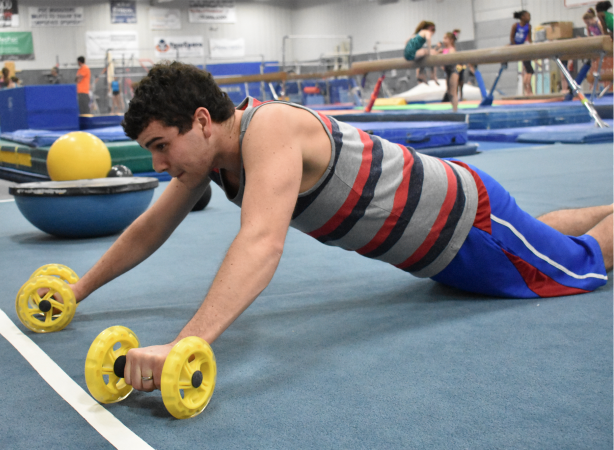 Students will utilize variety of gymnastics and fitness equipment to provide appropriate exercises for any fitness level. From Teens to Grandmas and new Mommies Get Fit is for you. Pay for one class and attend as many as you would like. Ninja gym is a fun, skill based, fast paced combination of Physical Challenges, Ninja Obstacles, Rebounding and Gymnastics. Students will be Swinging, Jumping, Hanging, Climbing, Flipping, and Bouncing their way through various ninja obstacles and physical challenges. 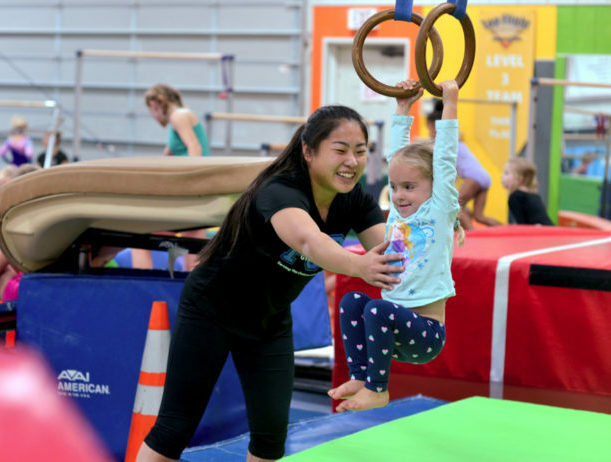 Ninja gym is designed to improve strength, flexibility, balance, coordination, athleticism in addition to building confidence, perseverance and determination. 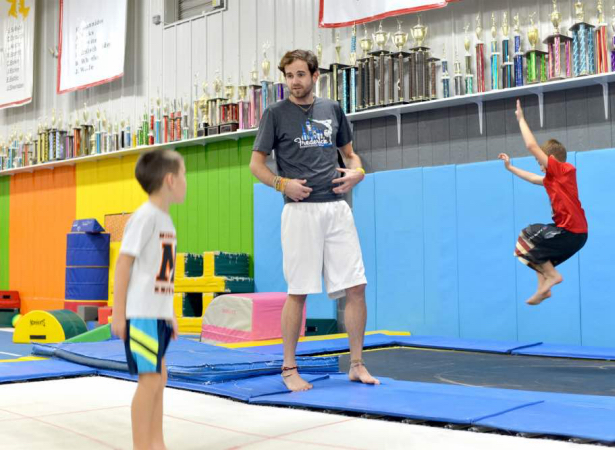 Frederick Gymnastics Club Runs A Year Round Program. Start Anytime…Register Today and Start Tomorrow! We offer a variety of events and clinics for all ages and skill level! Join us for open gym! Ages Kindergarten and up. 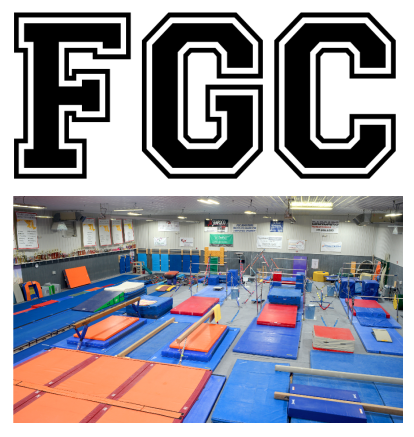 FGC is the perfect choice for your next birthday party! Excellent program!! Our daughter loved this program and the coaches were wonderful! The poise and confidence she learned has benefited her in her adult life! Great staff and a fun, encouraging atmosphere. The instructors/coaches are professional yet approachable and my children have learned so much in the year we've been with FGC. My son is approximately 5 and 1/2 and was in the all boys class this past cycle. The instructor, Matt, worked with them. I wish I could better express how it felt to watch my son, who doesn't liked to be pushed in a swing, doesn't like even being picked up for fear of heights; be enthusiastic about things like the uneven bars. Matt was consistent, encouraging, understanding, and patient with the group and because of this, my son who refused to even try the upper bar for most of the classes tried, and had that look of confidence that I will NEVER forget. Thank you! The gym will be closed May 25 through May 27. There will be no classes, open gym or team practice during this time. Classes and Team Practice resume on May 28th. FGC has made some changes this year. We have moved to a year-long class program, so there will not be a separate summer class schedule this year. Our current schedule will continue throughout the summer. Please register online at any time to start immediately in your classes.